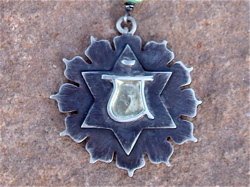 Chakra is an energy center or vortex. Your body has seven major chakras. 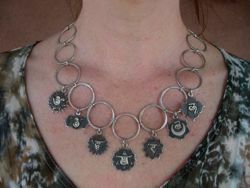 I decided to make chakra jewelry after studying the chakra system. Many cultures use this system which is called by different names. 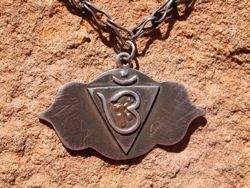 I use the Sanskrit chakra symbols on the corresponding lotus flower. Read about each chakra and pick one or more out to suit your needs. If you're still not sure, go with the one that is most attractive to you. 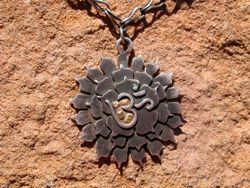 Each chakra pendant may be purchased on antiqued silver chain or on a beaded chain with the stone that corresponds to that chakra. For example, Crown with amethyst, Third Eye with lapis, Throat with turquoise or aquamarine, Heart with jade or variscite, Solar Plexus with amber, Sacral with carnelian or orange coral, Root with garnet or red coral. 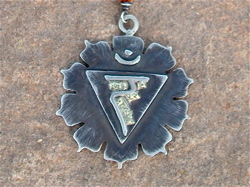 Each Chakra pendant is made with sterling silver and 14K gold inlay. Associated with - the brain and central nervous system. The brain provides the connection through which spirit enters; the throne of consciousness. Crown blockages - disconnection and fear of spiritual and psychological experience. Cancers of the brain and nervous system, lack of feeling, emotional depression. Associated with - the energies to support the entire set of senses including intuition, sight, hearing, taste, touch and smell. Third Eye blockages - breakdown of the senses, blind, insensitive, deaf to higher dimensions and lower, disconnection from others, inability to sense truths of others. Associated with - self expression in all forms, truth and communication, singing, acting, chanting, writing, painting. Throat blockages - sore throat, throat infections, aches at back of neck and shoulders, thyroid problems, low self esteem. 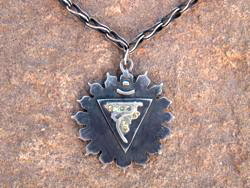 Associated with - the midpoint in your seven chakra system, balance point upon which all creation manifests. Love, wisdom, knowledge, purpose, unity, wholeness, expansion, balance. Heart blockages - chronic pain, heart disease, lack of love for others and oneself. 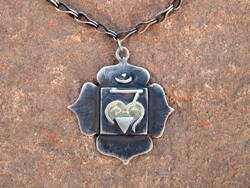 Associated with - action, divine will, nurturing, warmth, love of life, life giving breath of the divine creator. Solar Plexus blockages - digestive disorders, restriction means your cells do not have the energy needed to sustain life, lack of love and connection, inability to nurture self and others. Associated with - creation, provides energies that help us manifest our will in creation. Sacral blockages - sexual dysfunction, creative impotence, lack of power and self control. 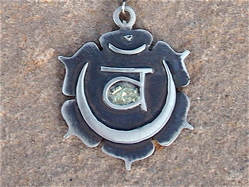 Associated with - energy flow, circulation, support, grounding; it is the seat of life. Root blockages - gastrointestinal disorders, the descent of age, fear of the physical world, lack of trust, feelings of victimization.